Friday’s terrorist fire that killed an IDF soldier was at least the 23rd major attack since the ouster of Egyptian President Hosni Mubarak in the “New Middle East,” a phrase coined by U.S. President Bill Clinton 15 years ago and echoed by President Barack Obama. Most of the attacks have taken place since the Muslim Brotherhood took power. The Arab Spring revolution in early 2011 demanded the ouster of Mubarak, a move encouraged by the Obama administration. He was replaced by a military regime and then by the current Muslim Brotherhood government in elections carried out under enthusiastic State Dept.officials, who have championed democracy as a key to peace in the Middle East. Washington’s first self-proclaimed success was the staging of Palestinian Authority legislative elections six and a half years ago. Under the supervision of American monitors, the results shocked then-U.S. Secretary of State Condoleezza Rice, when she was awakened in the middle of the night to be informed that the Hamas terrorist organization won a majority of the seats in the PA parliament. In Egypt’s Sinai Peninsula, “Lawlessness and attacks along the border with Israel have been on the increase since President Hosni Mubarak's ouster in February 2011,” AFP reported Sunday. Approximately half of the attacks have been aimed at the Egyptian-Israeli natural gas pipeline. Terrorists have been trying to disrupt the flow of gas to encourage Cairo to cancel the agreement, which anti-Mubarak parties alleged sold the gas at a lower than market price. Mubarak and his family were accused of pocketing millions of dollars from bribes in the deal. Following is a time line of other major attacks in the Sinai, provided by AFP, whuch does not include dozens of attempts by terrorists to infiltrate into Israel or smuggle arms and explosives into Israel. August 18, 2011: Armed terrorists from Sinai kill eight Israelis, including a soldier and a police officer, in attacks on buses in neighboring Israel. The IDF chased and killed seven of the terrorists, along with five Egyptian police officers. As a result, Egypt recalls its ambassador from Israel in protest, and Israel's embassy is subsequently attacked and destroyed by paid rioters in Cairo. June 18, 2012: Two gunmen and an Israeli civilian are killed in an exchange of fire along Israel's southern border with Egypt. 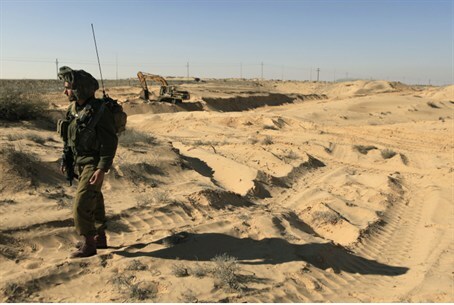 In a bid to prevent infiltration and attacks Israel speeds up construction of a fence along its border with Egypt. July 13-16: Egyptian Bedouin terrorists abduct and then release two U.S. tourists, along with their Egyptian guide. July 19: Gunmen believed to be Muslim terrorists shoot dead two Egyptian soldiers in northern Sinai. July 22: Attackers blow up a gas pipeline in the Sinai used to export fuel to Israel and Jordan, the 15th such incident since 2011. August 5: Gunmen kill 16 guards in Egypt near the border with Israel before stealing armored vehicles and crossing into the Israel, where they are attacked by a helicopter. The attack is the worst against Egyptian forces in the peninsula since the Israeli-Egyptian peace treaty of 1979, which returned Sinai to Egypt. August 8: Egyptian forces kill 20 terrorists in Sinai, hours after the military funerals for the 16 killed guards. Israel hails the attacks. August 9: In accord with Israel, Egypt deploys troops in the Sinai. September 8: In one of several such clashes, the Egyptian army says it has killed 32 “criminal elements” in the Sinai. Monday September 21: Terrorists infiltrate Israel from the Sinai and clash with Israeli troops. Three of the terrorists and Israeli soldier Netanel Yahalomi are killed. Although AFP reported that Egypt deployed troops in the Sinai “in accord with Israel,” the government objected to the Muslim Brotherhood regime’s sending in numerous tanks and airplanes. The 1979 Peace Treaty requires Israeli approval for deployment of heavy arms and a significant increase in the number of Egyptian soldiers, both of which took place allegedly without the approval of Israel. Egypt removed its tanks after several days.